* Each of the 52 rabbits shipped the week of September 24, 2001 to USAMRIID Building 1425 to join Dr. Ivins in the Biolevel 3 lab had a unique identifying microchip. « CASE CLOSED … what really happened in the 2001 anthrax attacks? « * Dr. Ivins and his colleagues were not allowed to deviate from the protocol relating to the animal challenges in late September and early October 2001 unless a deviation was specifically approved by the animal care committee. * Each of the 52 rabbits shipped the week of September 24, 2001 to USAMRIID Building 1425 to join Dr. Ivins in the Biolevel 3 lab had a unique identifying microchip. This entry was posted on December 26, 2011 at 11:34 am	and is filed under Uncategorized. Tagged: *** 2001 anthrax attacks, *** Amerithrax, *** Dr. Bruce Ivins, *** FBI anthrax investigation, Ivins & rabbits, ivins lab work in fall 2001, USAMRIID Building 1425. You can follow any responses to this entry through the RSS 2.0 feed. You can skip to the end and leave a response. Pinging is currently not allowed. “This protocol was originally approved for 52 rabbits. We are requesting an additional 52 animals in this addendum. The ultimate objective of the study was to determine whether formaldehyde should be included in a new recombinant PA (rPA) anthrax vaccine. 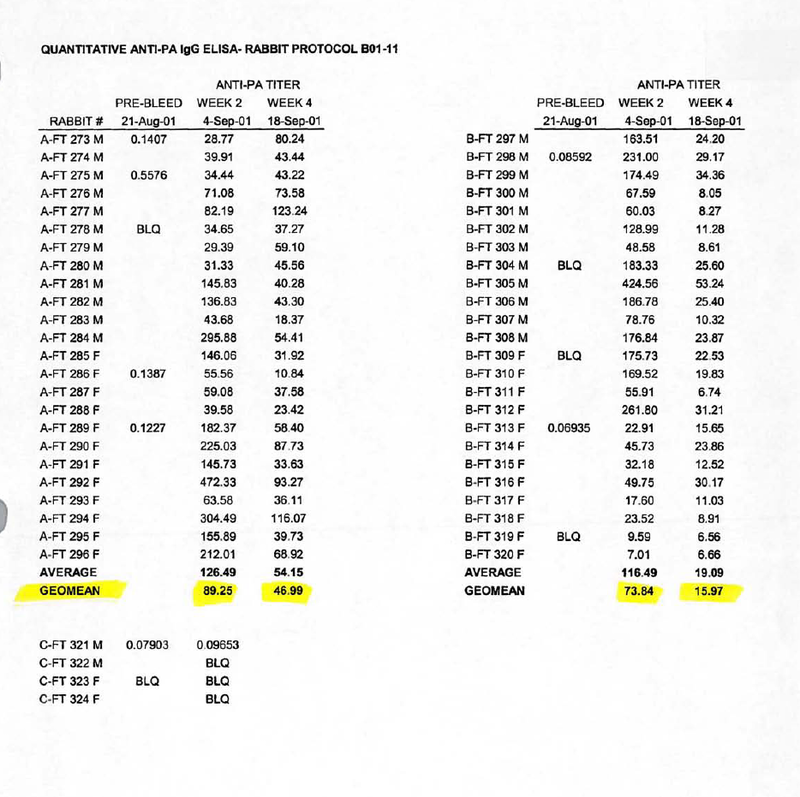 The specific objective was to determine if there was any potency difference in rPA/Alhydrogel anthrax vaccines (+/- formaldehyde) prepared in 1996 for protocol B96-08 and stored since then at 4 [degrees] C. The hypothesis was that we would find that formaldehyde was not required for preservation of potency upon storage of an rPA/Alhydrogel anthrax vaccine. 2. Results of the study: 1) As determined by SDS-PAGE, there was little or no degradation of rPA bound to Alhydrogel in the absence of formaldehyde; 2) There was an increase in survival (not statistically significant) in the group receiving vaccine containing formaldehyde (16/24) compared to the group receiving vaccine without formaldehyde (11/24). Comment: Dr. Vahid Majidi wrote me stating his supposition that the September/October 2001 study I pointed to was done at some other facility. He was wrong. By now, he should have read enough of the uploaded documents to know that. There simply is no excuse given the importance of the matter for him not to have learned that the 52 rabbits were shipped from Covance to USAMRIID on September 24, 2001. There simply is no excuse for him not to have corrected and re-uploaded the e-book he is selling. It is never too late to be right — untii it is. But there is always an obligation to correct mistakes. Let’s hope he corrects his mistake before it is too late. Dr. Ayman Zawahiri and my one-time Facebook friend Yazid Sufaat are counting on him that Vahid doesn’t. I cannot praise enough USAMRIID’s responsiveness in working through the issues. If litigation is necessary this Fall over yet additional documents, it will only be because their counsel does not understand the legal precedent. There simply is nothing more fun than FOIA litigation (which typically is resolved on motion for summary judgment) — no one should stand in the way of the very best evidence available in reconstructing the truth. We all have a moral obligation to do our utmost in avoiding the next 9/11. The rabbits were shipped in Week 5. Elsewhere a year or two ago I mistakenly said that they were shipped Week 9, relying on a less pertinent document.